Mined ores are processed to concentrate the minerals of interest. In the case of metal ores, these mineral concentrates usually need to be further processed to separate the metal from other elements in the ore minerals. Smelting is the process of separating the metal from impurities by heating the concentrate to a high temperature to cause the metal to melt. Smelting the concentrate produces a metal or a high-grade metallic mixture along with a solid waste product called slag. The principal sources of pollution caused by smelting are contaminant-laden air emissions and process wastes such as wastewater and slag. One type of pollution attributed to air emissions is acid rain. The smelting of sulfide ores results in the emission of sulfur dioxide gas, which reacts chemically in the atmosphere to form a sulfuric acid mist. As this acid rain falls to the earth, it increases the acidity of soils, streams, and lakes, harming the health of vegetation and fish and wildlife populations. In older smelters, air emissions contained elevated levels of various metals. Copper and selenium, for example, which can be released from copper smelters, are essential to organisms as trace elements, but they are toxic if they are overabundant. These metals can contaminate the soil in the vicinity of smelters, destroying much of the vegetation. In addition, particulate matter emitted from smelters may include oxides of such toxic metals as arsenic (cumulative poison), cadmium (heart disease), and mercury (nerve damage). When compared to pollution caused by air emissions, process wastes and slag are of less concern. In modern smelters, much of the wastewater generated is returned to the process. If the economic value of the metal concentrate in slag is high enough, the slag may be returned to the process, thereby reducing the amount requiring permanent disposal. New technologies are playing an important role in reducing or even preventing smelter pollution. Older smelters emitted most of the sulfur dioxide generated, and now almost all of it is captured prior to emission using new technologies, such as electrostatic precipitators, which capture dust particles and return them to the process. Raw material substitution or elimination, such as recycling lead batteries and aluminum cans, decreases the need to process ore, which reduces pollution. Some of the major federal statutes and regulations that apply to smelting are the same as those that have applied to mining since the Clean Air Act (CAA) of 1970 became law. The CAA established nationally uniform standards that control particular hazardous air pollutants. Sudbury, in Ontario, Canada, is one of the world's largest smelting complexes, with an international reputation as a highly polluted area that has been mined for more than one hundred years. The environmental impact was completely or partially denuded vegetation on over 46,000 hectares and 7,000 acid-damaged lakes. Smelting caused much of the ecological damage via acid rain and elevated levels of copper and nickel in the vicinity of the smelters. 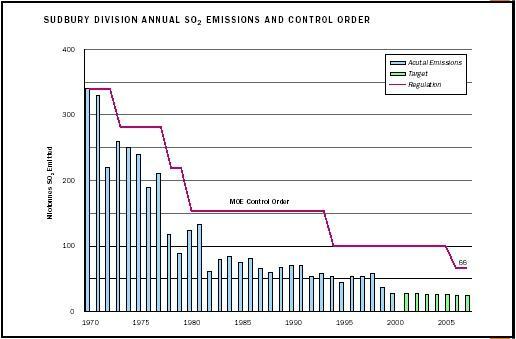 Efforts by government and industry since the 1970s have eliminated most of the sulfur dioxide emissions in the area, and there has been significant progress toward achieving sustainable ecosystems. SEE ALSO A CID R AIN ; A IR P OLLUTION ; L EAD ; M INING ; S UPERFUND . Gunn, John M. (1995). Restoration and Recovery of an Industrial Region. New York: Springer-Verlag. Weiss, Norman L., ed. (1985). SME Mineral Processing Handbook. Kingsport, TN: Kingsport Press. U.S. Environmental Protection Agency. (1995). "EPA Office of Compliance Sector Notebook Project: Profile of the Nonferrous Metals Industry." U.S. EPA Document No. EPA/310-R-95-010. Available from http://es.epa.gov . U.S. Geological Survey. (2001). "Mine and Mineral Processing Plant Locations—Supplemental Information for USGS Map I-2654." Available from http://pubs.usgs.gov . U.S. Geological Survey. (2001). "USGS Tracks Acid Rain." Fact Sheet FS-183-95. Available from http://pubs.usgs.gov .